This video shows what happens at the biometric interview for fingerprinting and digital photograph at the Visa application center. See what happens inside the US consulate when you go for a USA visa interview. Perfect for those going for visitor visa interview for the first time. Traveling to USA? Worried about the immigration and customs procedures? Worried about airport rules? This video is for you! Travel guide for Indian visitors taking a return flight from USA to India, especially suited for elderly people apprehensive about flying. What to do at the port of entry? US Visa Fingerprinting and Photograph process at the Visa Application Center. Applicants from certain countries need to take a biometric interview at the Off-site Facilitation Center for Fingerprinting & Digital Photograph prior to the us visa Interview. 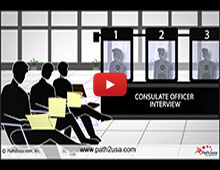 This video shows you what happens inside the consulate when you go for a Visitor visa interview. This video applies to all non-immigrant visa interviews like visitor visa (B2 visa), business visa (B1 visa), H1B visa, L1 visa, F1 visa, etc. Featuring the first ever guide for taking a flight to USA, especially suited for elderly people apprehensive about flying. printable travel guide to USA. Travel from USA to India with information on immigration forms and customs forms, specially suited for people flying to India for the first time or apprehensive about taking a flight and going through immigration and customs procedures.